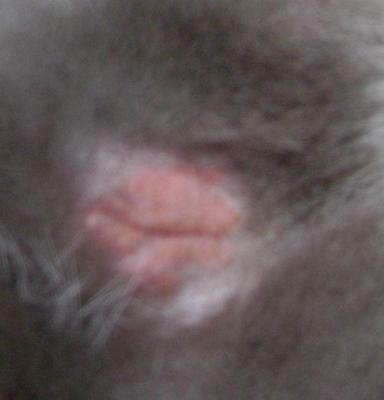 My cat is suffering from hair loss on the top inner side of the right front leg. She has no history of hair loss, nor any medical conditions. Cat is a gray generic cat, not sure what type. Mostly lives indoors and is age 10. I've seen no changes in personality and no other other hair loss other than what is seen on the right front leg. Picture is attached to this question. Please let me know what you think is wrong. Any advice regarding how to treat cat hair loss on a leg would be appreciated. I’m afraid the list of potential diseases that cause patches of hair loss is very long. If your cat were my patient, I would start the diagnostic process with a physical exam, and then, unless the answer was obvious (e.g., fleas), I’d move on to a skin scraping to look for mites, skin cytology to check for infection, and then a fungal culture for ringworm. The test for ringworm can take two or three weeks to complete, so while we were waiting for the results I would treat for anything that I diagnosed with the other tests, perhaps prescribe a broad spectrum parasiticide like Revolution to deal with some of the mites that can be hard to find on skin scrapings, and pursue any other leads that I might have. If the fungal culture came back negative and your cat was still not better, we’d have to consider additional diagnostic tests like skin biopsies, a hypoallergenic food trial, or environmental allergy testing. Join in and write your own page! It's easy to do. How? Simply click here to return to Cat Hair Loss.